The information security industry will continue to grow in size, density and specialization (Tipton, 2010). The demand for qualified security professionals who possess relevant knowledge and required skills is growing and will increase substantially (Miller, 2012) (Suby, 2013). The information security discipline is complex and requires continuous investment in training (Suby, 2013). Recently, various articles posted in the media illustrate demand for security professionals (Ballenstedt, 2012). The Cyber workforce has also increased by 600 percent over the last few years. As an example, a search for the phrase “IT Security” on jobserve.com for IT & Telecommunications industry returned over 5000 jobs in UK. As far as the biggest Swiss job portal jobs.ch is concerned, running the same query resulted in over 300 job postings. That being said, the following question is being raised: How can one help and facilitate the growth of these information security skills? One key method is via training and education. Even though there are plenty of systematic, formalized security training programs, the hands-on training method provides opportunities to practice skills under the most realistic conditions possible (Sisson, 2001). One option is to build an environment that is designed to mimic real life situations by creating a simple virtual IT infrastructure lab that will allow simulating complex implementations . This creates an environment that will have the flexibility to accommodate changes by adding and removing components at will. This environment will represent real-world security issues with their respective flaws in an interactive, hands-on experience which comes with greater advantage over traditional learning methods because security issues often require substantial hands-on training in order to be understood and mastered (Erickson, 2008). In addition there is the advantage of being in a controlled environment in which unforeseen events are nonexistent or at least minimized (Gregg, 2008). By creating this environment we foster the knowledge and promote learning. Topics such as incident handling, intrusion analysis, system administration, network security, forensics or penetration testing can be practiced, explored and explained. In order to maintain focused, we need to define a clear scope while creating such an environment. Each one of the aforementioned security domains would take several book volumes to be adequately covered. The environment is flexible enough to allow simulating any of those domains. In this article series we will focus only on familiarizing users with offensive and hacker techniques, attack methods and exploits – all of which the reader can learn, practice at his or her own pace. We won’t focus on the countermeasures or defensive techniques which can be an opportunity for the reader to conduct further research. For example, an incident handling question could be: how could you better prepare and be able to identify such attack methods? Or how could you contain, eradicate and recover from such attacks? This article series aims to provide an introduction and encourage further research using the same or similar environments. It is important to realize that some of the techniques that will be demonstrated could be used to commit nefarious acts, and this series of articles only provides them so the reader understands how attack methods work. It is also important to understand that as a security professional, readers should only use these methods in an ethical, professional and legal manner (Skoudis & Liston, 2005) (John & Ken, 2004). The methodology presented creates an environment that will mimic a small business network which will be modified in order to make its defenses weaker or stronger depending on the offensive tools and techniques the reader wants to practice. In addition, a combined arms approach is used to raise awareness of how combining different tools and techniques can lead to more powerful attacks. Throughout the series of articles the reader is encouraged to practice other scenarios and further explore the techniques and move into more advanced topics. Whether the reader is running Linux, Windows or OS X, a virtual environment can be easily build. There are a variety of virtualization systems and hypervisors available. The VMware Workstation was chosen due to personal preference, wide range of operating systems supported, and affordable price. Other open source and commercial solutions are available and the “thehomeserverblog.com” maintained by Don Fountain contains great articles about them. Use at least two monitors. The system should be equipped with sufficient RAM and fast I/O like SSD drives or USB 3.0 ports. In most cases an average desktop or laptop can run 2 to 3 machines but a more powerful system with 32GB RAM and enough storage can easily perform with 18 VMs. The first system to be deployed should be a 64 bit host operating system e.g., Windows 7 Professional in order to accommodate enough RAM (Microsoft, 2013). Next the hypervisor software is installed. In this case will be VMware workstation 8. The second component that should be built is a virtual firewall that will be the gateway to the isolated and controlled environment. This is important because the reader does not want to practice tools, exploits and other nefarious software in its home or production network (John & Ken, 2004). The firewall should have several interfaces mapping to different VMnets which will result in having different networking segments protected by firewall rules and routing. The reader can start with a single-arm DMZ. For a more realistic setup, a DMZ screened subnet approach with a dedicated segment for a management network is preferred. Moving beyond this by adding additional tiers of security is always possible at cost of proportional increase of environment complexity and resources. One of the interfaces of the firewall should be the management interface where the management traffic will reside and where the management systems are. Another interface of the firewall is considered the external. This interface, in the VMware terminology, is configured as Bridge mode. It will connect the environment to the real-world (host network) where the reader might have his wife’s and kid’s laptop plus the wireless and router devices to be able to connect to the Internet. The environment used here contains a distributed Checkpoint firewall but any other firewall would work. The reader should choose one that he feels comfortable with or one that he would like to learn about. The distributed Checkpoint installation is made up of two machines: a firewall module and a management station based on SPLAT version R70. Both machines are managed using a Windows server called GUI, that contains the Smart Console client software. To optimize the install, the DHCP server will be disabled and each VMnet will be mapped to an appropriate network range. In this environment three (3) DMZ networks were created in the firewall. Each DMZ is assigned an RFC1918 IP network range and will be mapped to a different VMware network. Below figure depicts the network diagram and the high level steps to create the environment are described on the end of this article. In terms of firewall rules the environment contains a very simple approach where HTTP traffic is allowed from anywhere to the Web server. This is a typical scenario in a small business network. Then the internal DNS server is allowed to make UDP connections towards a public DNS server. Another rule allows NTP synchronization between the various machines and a public NTP server. Management traffic that allows communicating with the firewall is defined by default as part of the implicit rules. The initial firewall rule base is shown in the figure below. Install the host operating system e.g. Windows 7 PRO 64bits. Configure VMnets using Virtual Network Editor. 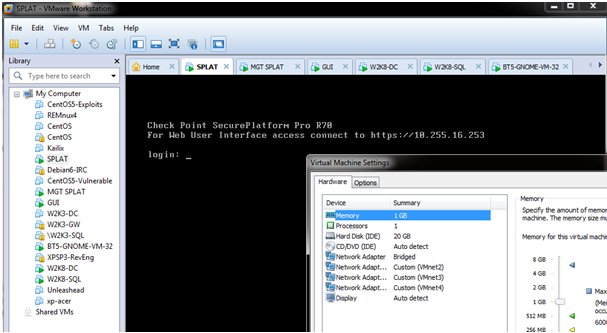 Install and configure the Checkpoint Management Station R70 in VMnet4. Install Windows OS and Checkpoint Smart Tools in VMnet4. Configure the Firewall with 4 interfaces. Configure routing and define the firewall rules. Test the connectivity among the different subnets. Part 2 will follow with windows systems and infrastructure. Skoudis, E., & Liston, T. (2005). Counter hack reloaded: A step-by-step guide to computer attacks and effective defenses, second edition. Prentice Hall..
Gregg, M. (2008). Build your own security lab: A field guide for network testing. John Wiley & Sons. John, A., & Ken, B. (2004). Creating a secure computer virus laboratory. Manuscript submitted for publication EICAR 2004 Conference, Department of Computer Science, University of Calgary. Erickson, J. (2008). Hacking: The art of exploitation, 2nd edition. No Starch Press. Tipton, W. Hord, “Preface” Preface (2010). Official (isc)2 guide to the issap cbk. Auerbach Publications.